The 150th Anniversary special edition of the best-selling reference book of all time! Larger hardcover format of this essential resource offers larger type sizes and more user-friendly access to thousands of facts. 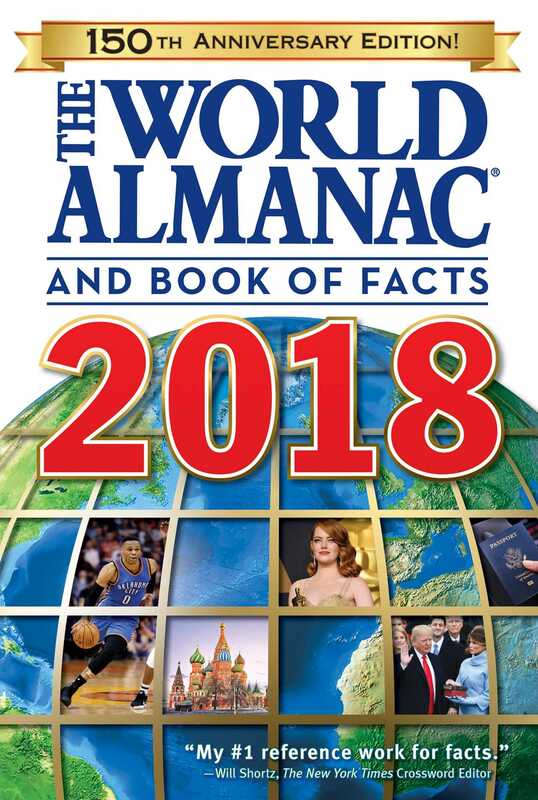 150 Years of The World Almanac: A special feature celebrating The World Almanac's historic run includes highlights from its distinguished past and some old-fashioned "facts," illustrating how its defining mission has changed with the times. Historical Anniversaries: The World Almanac's recurring feature expands to incorporate milestone events and cultural touchstones dating to the book's founding year, from the impeachment of President Andrew Johnson to the publication of Little Women. World Almanac Editors' Picks: Greatest Single-Season Performances: In light of Russell Westbrook's unprecedented 42 regular-season triple-doubles (and the second-ever season triple-double), The World Almanac takes a look back in sports history for athletes' best single-season runs. Statistical Spotlight: A popular new feature highlights statistics relevant to the biggest stories of the year. These data visualizations provide important context and new perspectives to give readers a fresh angle on important issues. The Obama Presidency: A year after Barack Obama’s second term came to a close, The World Almanac reviews the accomplishments, missteps, and legacy of the 44th president. The World at a Glance: This annual feature of The World Almanac provides a quick look at the surprising stats and curious facts that define the changing world. Other New Highlights: A brand-new biography of the 45th president and profile of the Trump administration; official 2016 election results; and statistics on criminal incarceration and sentence lengths, health care, overdose deaths, shootings, terrorism, and much more. The Year in Review: The World Almanac takes a look back at 2017 while providing all the information you'll need in 2018. 2017—Top 10 News Topics: The editors of The World Almanac list the top stories that held the world's attention in 2017. 2017—Year in Sports: Hundreds of pages of trivia and statistics that are essential for any sports fan, featuring a preview of the upcoming 2018 Winter Olympic Games, complete coverage of the 2017 World Series, new tables of NBA, NHL, and NCAA statistics, and much more. 2017—Year in Pictures: Striking full-color images from around the world in 2017, covering news, entertainment, science, and sports. 2017—Offbeat News Stories: The World Almanac editors found some of the quirkiest news stories of the year, from the king who secretly worked as an airline pilot for decades to the state that's auctioning off its governor's mansion. World Almanac Editors' Picks: Time Capsule: The World Almanac lists the items that most came to symbolize the year 2017, from news and sports to pop culture.